A joint post by Kristjana Sigurbjörnsdóttir, UNU-GEST and Ortrun Merkle, UNU-MERIT. “To make UNSCR 1325 a reality we need to get out of our comfort zone” – the frank assessment of Marriët Schuurman, NATO Special Representative for Women, Peace and Security (WPS) at the start of a UNU conference on inclusive peace and the future of WPS. Her words reflected a shared sense of urgency: of the need to make bold demands and drastic reforms in the struggle for inclusive peace. The concept of inclusive peace, which requires the inclusion of all major stakeholders and the active participation of women and men at all levels of conflict prevention and resolution, peacebuilding and peacekeeping, was at the core of the conference. It has long been recognised that higher levels of gender equality lead to more peaceful societies. Yet we are still far from achieving equality in reality. Despite UN Security Council Resolution (UNSCR) 1325 on Women, Peace and Security recognising in 2000, for the first time, the active role played by women worldwide in the peace and security agenda, the international discourse still focuses on the passive victimhood of females. Last year momentum was built around the 15th anniversary of UNSCR 1325; numerous events were held and papers were published, all taking stock and discussing ways forward. Joining the debate, this UNU-GEST conference identified one of the obstacles for practitioners and academics: that we tend to ignore the lived realities of women in many conflict and post-war societies. 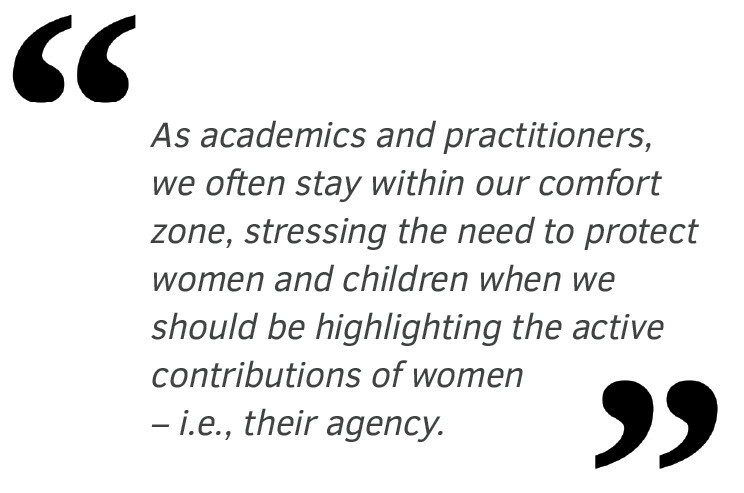 As academics and practitioners, we often stay within our comfort zone, stressing the need to protect women and children when we should be highlighting the active contributions of women – i.e., their agency. Additionally, women are often included in the peace and political process only to help with ‘women’s issues’, instead of being natural, structural contributors to all aspects of policymaking. On many levels, this creates an environment of ‘pro forma involvement’ of women, rather than active, positive inclusion. At the conference itself, participants did more than analyse the current situation; we also discussed ways to mainstream women’s agency. And we agreed that there is no more time for patience or half-measures; we need to demand more for women, now and in the future. Because these factors are nothing less than pillars of peace and we should demand their recognition! Back in 2014 the World Economic Forum warned that if we simply carry on business as usual then global gender equity and equality will not be achieved until 2095. For practitioners and researchers alike, understanding gender relations and how the status of men and women in society is socially constructed and dictated, requires a critical analysis with a specific gender lens. According to Cynthia Enloe, a renowned feminist scholar and thinker, this requires not only a certain intellectual curiosity but a will to unravel the layers of patriarchy. On one level, this means accepting that patriarchal structures also persist because women often support them. On another level, it is not enough to understand the lived experiences on the ground; we also need to study institutional and organisational structures from a feminist perspective to understand how these hinder women’s agency. Gender mainstreaming in conflict prevention and awareness was another topic of debate. There is a feeling of mixed progress so far in this area of the WPS agenda; many organisations or bodies that set normative standards and protect people in conflict and post-conflict situations have not dealt with this process in a very productive way. Additionally, there is a growing realisation that gender mainstreaming has to become a natural part of the project and programme cycle, not just something used when convenient or addressed by special gender divisions. In our attempt to move beyond rhetoric into action that matters to the lives of women and men living in conflict situations and in the aftermath of war, we need to reach beyond the purely analytical and find concrete means to address underlying problems. This is only possible if all actors, including men and boys, are brought to the gender equality table. Lastly, to achieve lasting results, it is time that we aim higher and ask ourselves some basic but rather uncomfortable questions. Why do women have to constantly justify their contributions, when men are never asked what they bring to the table? While it is good to discuss what concrete benefits women’s participation brings, it is essential to remember that it is above all a fundamental human rights issue. Why do we demand only 30% female representation in political life, when in most places women make up more than 50% of the population? How can we expect to break open patriarchal structures if we are not willing to give up the feeling of comfort that some of these structures provide? And how can we ensure that women are seen less as passive groups requiring protection and more as active agents of change? Post 2015, a landmark year of global efforts towards women’s rights and gender equality, the focus must now be on real progress for women’s lives. More needs to be done to increase the active role of women as agents of change in all parts of the policy process. It is high time to step out of our comfort zone. Without addressing questions outside of our comfort zone, achieving real inclusive peace is implausible.